The Islam Awareness Blog: Prof. Tariq Ramadan: IRANIAN NUCLEAR WEAPONS, BLASPHEMY AND CAN TONY BLAIR SAVE THE MIDDLE EAST? 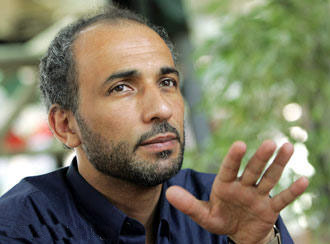 Prof. Tariq Ramadan: IRANIAN NUCLEAR WEAPONS, BLASPHEMY AND CAN TONY BLAIR SAVE THE MIDDLE EAST? What is the correct response to the protesters who have responded violently to the film that insults Mohamed? The protesters fell into the exact trap set by those who launched it. The Salafi literalists tried to mobilise the people against “The United States” by promoting a type of religious populism based upon a simplistic and dangerous generalisation: Americans hate us and we are better Muslims when we reject them. The best response would have been to ignore the video and to unite with all the people (Muslims and people of other religions or with no religion) who want to protect freedom of speech while asking individuals to use this right in a decent, respectful and reasonable way. Is The Satanic Verses a blasphemous work? If you assess it from within the religious framework, it can be considered as blasphemous. Yet it is not as simple as that for two reasons: the author no longer considers himself as a Muslim and he wrote a novel. Taking into account that he is speaking from outside the Islamic religious reference (as a non-believer) and that it is fiction, it can be argued that this qualification is questionable. In any case, as I wrote in 1989 when the controversy started, this fatwa was more political than religious and wrong and unacceptable in substance. Should Western nations prosecute blasphemy against religion? I do not think that prosecuting blasphemy will change anything. The current legal framework is enough and we need to protect our rights, freedom of conscience and freedom of speech. Upstream from these rights, we need to educate people to learn how to nurture an ethical behaviour while they enjoy freedom. Just because something is legal does not necessarily mean that it is always good: you can ridicule the suffering of somebody (that is legal) but it is not really ethical. The same goes for a sense of humour: if you make a joke and you are the only one to laugh, it is no longer a joke. Only education can help us to manage pluralism positively. How do you view the prominence of right-wing Christianity within the US Republican movement? The right-wing American or European Christians should be considered for what they are: populists and racists with very dogmatic and dangerous minds. Just as the salafi literalists do not represent all the Muslims, the populist right-wing Christians do not represent Christianity. They distort the Christian message and build their rhetoric on the same simplistic polarisation “us versus them”. The Muslims are the new enemies, “the cancer”, and even if American, they are considered as foreigners or outsider insiders. They are a danger not only to Muslims but to all of us. Is Tony Blair more part of the Middle East problem than the Middle East solution? He cannot be part of the solution in the Middle East for three reasons. The first is historical, given the involvement of Britain in the colonisation and the problems generated by this. The second relates to the unilateral support Britain has always given to Israel (and not to the Arabs). The third and most important is his own record: following in the footsteps of George W Bush, he accepted the lies related to the WMD in Iraq and launched a dirty war. Who can still trust him among the Arabs – and the British citizens? Is an Iranian nuclear weapons capability something to be deplored or tolerated? No, they cannot be tolerated just as nuclear weapons anywhere cannot be tolerated. What we do not want for Iran should not be tolerated for Israel. We are told that Israel can have nuclear weapons because they are less dangerous for regional peace than if Iran has them. That is very disputable. A survey a few years ago showed that the majority of Europeans thought Israel was the most dangerous country for peace. Let us be consistent and demand all the countries, without exception, get rid of such weapons.